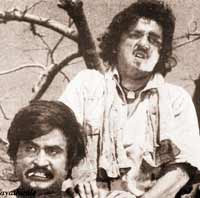 16 Vayathinile (also known as Pathinaru Vayathinile) (At the Age of Sixteen) (1977) is a Tamil feature film directed by Bharathiraja.The film stars Kamal Hassan, Sridevi and Rajinikanth. The film’s score and soundtrack are composed by Ilaiyaraaja. The film marked Bharathiraja’s debut as a film maker/screenwriter and it met with a strong critical reception upon release. This film involves a young, beautiful 16-year-old girl, Mayil (Sridevi), filled with ambitions of becoming a teacher. She is an attractive, intelligent woman living in the small society and experiences ripe love when sees the new vet who has come to visit. Many are impressed by this charming young fellow who has entered the vilage. He seems to be a wealthy, prosperous man and soon develops a relationship with Mayil. Mayil, who is deep in love, sacrifices her opportunity to study in the teaching college course to spend time with him. Little does she know, that he has not yet revealed his true colours. Sri Devi’s distant cousin Chapani (Kamal Hasaan) is quite dim, possibly a little mentally ill, and because he is lame, he is taken advantage of and isolated by the society. He is secretly in love with Mayil, and when he sees her in love with the vet, he is jealous and upset. Another important character is the big rowdy (Rajinikanth) who is also impressed by Mayil. Mayil is impacted by all these men in her life. * The film had an average talk for 4 weeks and then turned out to be a big hit. * The remake rights for the film was bought for Rs.1.25 laks by Rajalaxmi Art films to remake it in Telugu. * This film marked Bharathiraja’s debut in film making. * The producer of the film went into hiding to avoid income tax raids;as the film was a very big hit.